Video Poker - "Jacks or Better" is available for free download from Casino Games & Slots. 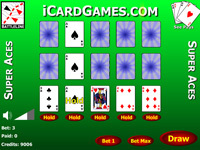 It is a Freeware casino style video poker game that is free to download and play. Before you hit deal, you may choose to bet 1, 2, 3, 4, or 5 credits. You may increase your bet by 1 by pressing the "Bet One" button, or immediately bet 5 by pressing the "Max Bet" button. If you are betting 5, you may press the "Bet One" button to reset the bet down to 1. 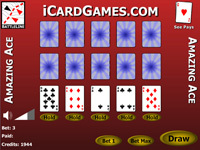 When you press the "Deal or Draw" button you will be dealt 5 cards. You may choose to hold any of the cards by clicking on the "Hold" buttons under the card, or clicking on the card itself. When you do so, the "Hold" banner is placed over top of the card. 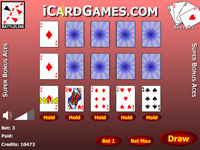 You may then click the "Deal or Draw" button again and you will be dealt a new card for each card you have not held. If you have won, you will receive credits based on the pay table above your cards. Royal Flush: Cards dealt are 10, Jack, Queen, King and Ace all in the same suit. Straight Flush: Cards dealt are a straight all in the same suit. 4 of a Kind: four cards of the same rank are dealt. Full House: a combination of 3 of a kind and a pair in the same hand. Flush: all cards dealt are in the same suit. 3 of a Kind: 3 cards with the same rank. Two Pair: two pair of cards with the same rank. Jacks or Better: a pair of cards with the same rank, where the ranking is Jacks or better. 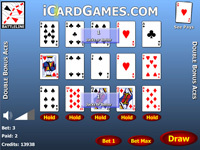 Amazing Ace is a variant of video poker where aces double the value of a hand. 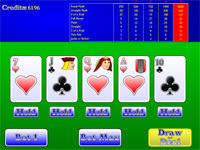 Bonus poker is a version of video poker based on Jacks Or Better video poker. 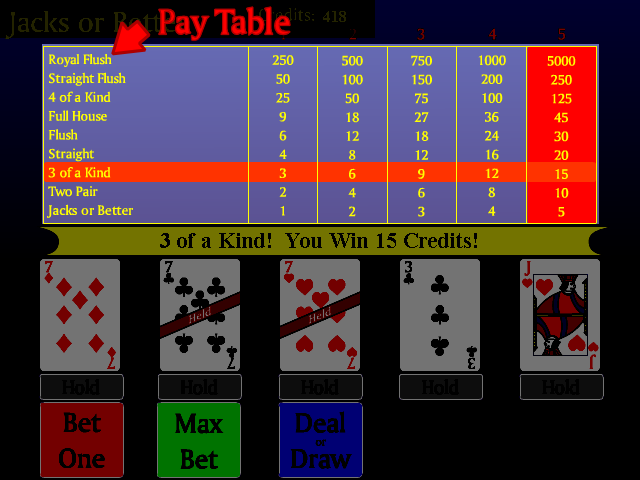 Bonus Poker offers a higher payout for 4 card combinations. 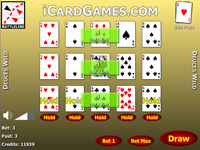 Deuces Wild is a version of video pokers in which deuces (2 cards) are wild and can be substituted for any other card. Super Aces Bonus is a combination of Super Aces video poker and Bonus video poker. 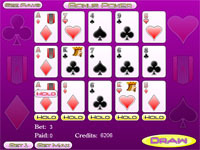 Super Aces Deuces Wild video poker is a combination of Super Aces video poker and Deuces Wild video poker. Super Aces Double Bonus video poker is a combination of Super Aces video poker and Double Bonus video poker. 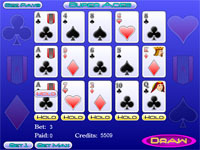 Super Aces video poker is a casino video poker game based on Jacks Or Better video poker, but with a higher payout for 4 Ace combinations. 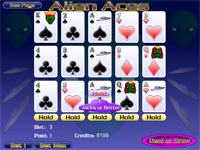 Alien Ace is an alien theme video poker game based on Super Aces video poker. Five Play Bonus poker by FreeCasino1.com is a 5 hand bonus video poker game. Free Casino Bonus Poker is a three hand free online video poker game. 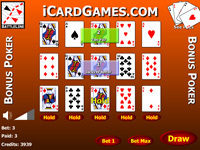 Free Casino Super Aces Poker is a three hand free online video poker game. 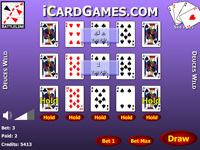 Free Casino Jacks Or Better video poker is a free online Jacks Or Better video poker game you can play online.